Those of us in Montessori education know why your child should attend a Montessori school. Via daily interaction with the Montessori environment, their fine motor skills are strengthened and their reasoning skills are sharpened. They also develop the ability to think and act independently. Prince George started his first day of preschool on January 9th, 2016. His proud mum photographed him and posted the picture on Instagram. The 2-year-old son of Prince William and the Duchess of Cambridge is attending the Westacre Montessori School in Norfolk, close to their country estate. Any wonder why the parents selected Montessori for the kid. Obviously, they want the best for their kids. Though, we might see all the amazing results of the Montessori education, we might know how it happens. Is it just a stroke of luck? Dr. Hughes completed his Ph.D in clinical psychology at the University of Minnesota and his post-doctoral fellowship in pediatric neuropsychology at the University of Minnesota Medical School, where he joined the faculty of the Division of Pediatric Clinical Neurosciences in 2001. Dr. Hughes’ work reminds us of Maria Montessori. She was a scientist before she became an educator. There was no guess work in the materials she created. She was a keen observer. She allowed the children to teach her rather them her own ideas. Dr Hughes’ work shows why your child should attend a Montessori school. Here are Nine significant reasons why your child should attend a Montessori school. In Montessori, children are encouraged to work at their own pace. They are not burdened with test scores, competition and grades. They are even allowed to choose and follow their interests in reading, writing, and research. This type of method allows children with special needs to flourish. The multi-age classroom allows the teacher to stay in the same classroom with a child for 3 years. This would help the teacher build a very strong relationship between both the parents and the child. The child is not stressed with always starting in a new classroom at the beginning of every school year. This is another very strong reason why your child should attend a Montessori school. Emphasis is placed on peace, cooperation, and respect in Montessori education. This reduces the possibility of the child with special needs to be teased or ostracized. In fact, the other children usually make an effort to accept, befriend, and encourage a special needs child. The pre-school child is at a very crucial stage of development. 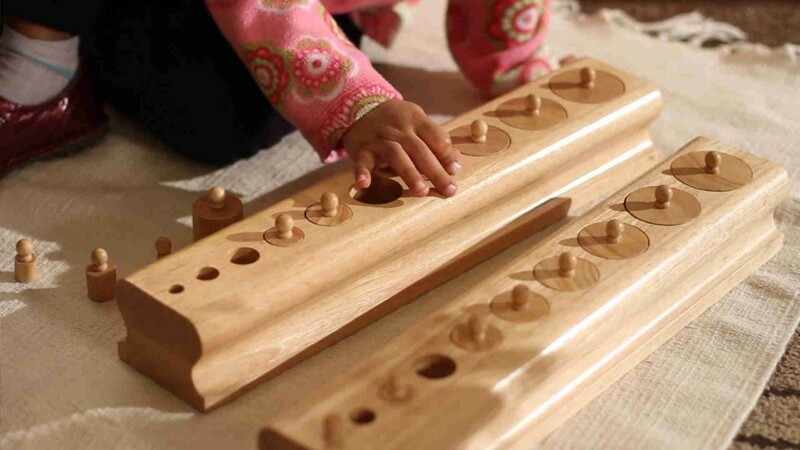 The core curriculum of Montessori is centered around this developmental milestones. Three-year old’s focus on sharpening large muscle and language skills, while four -year-old’s fine-tune their motor skills and completing everyday activities, such as cooking and arts and crafts. Five-year old’s typically broaden their learning experience to their communities, through field trips and special events. Teachers don’t just pour down information of children in the Montessori school. They don’t even determine how the experiences would be. They act as “guides” that are there to assist in the learning experience. Teachers will develop the curriculum based on the children in the classroom and do not determine the pace of the classroom. Montessori teachers attempt to be as unobtrusive as possible. Children in a Montessori classroom environment learn how to share and cooperate with one another. The children determine what the activities in the classroom will be throughout the day, and this tends to build a sense of community. This in turn encourages children to share and work courteously with one another to explore the various stations in the Montessori classroom. One of the reasons why your child should attend a Montessori school is the Hands-on learning. Emphasis is placed on concrete learning as opposed to abstract learning, which means that students will work on activities that teach language, math, culture and practical life lessons. Teachers make sure students focus on tasks, and discourage them from disturbing and interrupting one another. This allows maximal concentration on activities until the concepts are properly grasped. Students are encouraged to explore activities and concepts at their own pace. This naturally inspires children to try more challenging activities, which hastens their learning experience. Learning occurs at a comfortable tempo for each student, instead of imposing the same pace on every student.